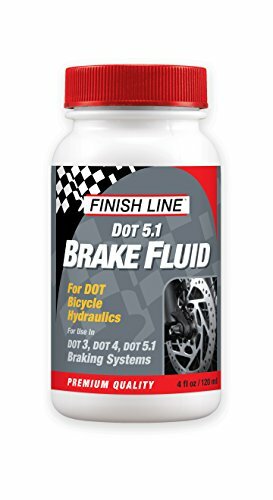 A high-Performance DOT 5.1 Oil formulated specifically for bicycle brake systems and feature no compromise, leading edge chemistry to provide superior fluid life and braking performance . Finish Line's Mineral Oil Brake Fluid is far from your basic, common mineral oil - we spent some time in the lab and discovered, there's a big difference between your basic mineral oil and what we developed and are proudly calling 'high performance'. Features a super low viscosity to yield superior lever response, pad retraction, and consistent performance through a full range of operating temperatures. Specifically engineered for use in bicycle hydraulic disc brake systems and are compatible with all brake systems currently sold. When you're serious about getting the most out of your braking system, Finish Line Brake Fluid is the only choice. Specifically engineered for use in bicycle hydraulic disc brakes Provides maximum fluid life and braking performance, even at low temperatures Prevents foaming and overheating.